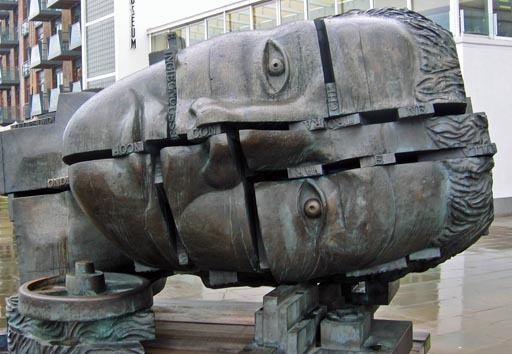 Long-time readers of Londonist will know that we’ve got a slightly unhealthy obsession with late sculptor Sir Eduardo Paolozzi. You know, the guy who gave us the TCR Tube mosaics and the statue of Newton outside the British Library. Many moons ago, we kicked off our Londonist Stalks… series by hunting down all his public works of art in London. And he’s since become something of a hero to us. Next month, we’ll be dusting down our notes and donning our stalking boots once again, as a major exhibition of Paolozzi’s work is coming to the Royal Academy. It is very exciting because many of the items you will see will not have been on show in London for maybe 20 or 30 years. He is undoubtedly one of the most versatile artists of the 20th century. As an artist he re-invented himself time and time again. This interest from the Royal Academy suggests a real renewed interest in his work from a whole new generation. Indeed. We are that new generation. And we’ll be first in the queue for tickets. Londonist Stalks…Eduardo Paolozzi, Charles Barry, Nicholas Hawksmoor, and Erno Goldfinger, with more on the way.